Art can be interpreted in numerous ways but sometimes it’s just plain obvious what the artist wanted to express: aliens and UFOs. Stone stands the test of time. 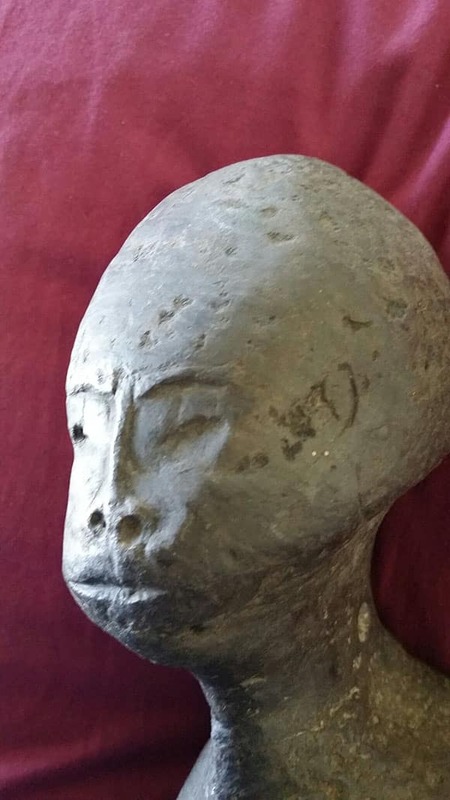 Because of this, we have the unique opportunity to see through the eyes of the ancients and, in the case of the Nuku Hiva sculptures, we can also gaze into the large, almond-shaped eyes of what could easily be described as a race of extraterrestrials. Nuku Hiva is the largest island in the Marquesas Archipelago in French Polynesia. European explorers reached the archipelago in the late 16th century but by then, the islands had been inhabited for close to 2,000 years by native Polynesians. This culture had left behind a number of intriguing works of art depicting beings with bulbous heads, large eyes; their appearance is eerily reminiscent of the Grey alien form we’re accustomed to. Some sculptures appear to represent hybrid beings exhibiting a mix of human and alien features. 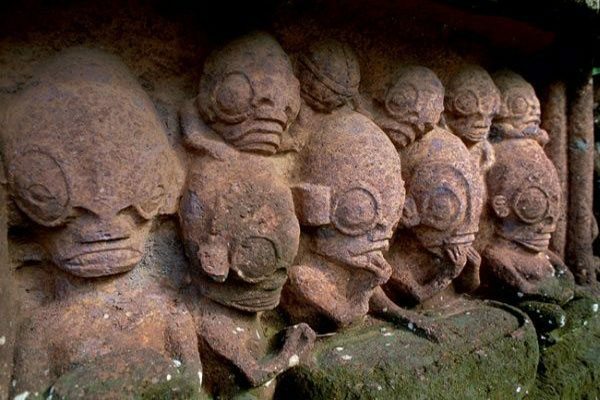 There are ufologists who claim there are two alien races carved in stone at Nuku Hiva: reptilian and grey. Could these ancient works of art be a testament of extraterrestrial involvement? 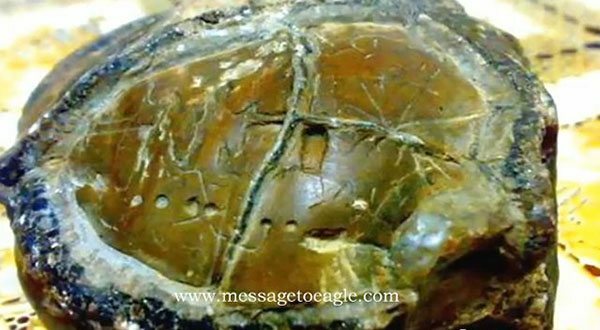 Did ancient aliens come into contact with the native populations, impacting them in such a way the humans felt compelled to carve their masks in stone? Whatever the case may be, one more thing needs to be said: in the South Marquesan dialect, the island was called Te Fenua ‘Enata, meaning “The Land of Men.” Maybe as opposed to aliens? Myths and legendary accounts from all over the world offer an abundance of clues regarding the presence of an extremely advanced race of aliens in ancient times, their influence still pervasive today. In all likelihood, these beings helped erect massive monuments that have survived millennia, many more still waiting to be discovered. Known by different names and considered gods, these creatures once crisscrossed Earth’s sky in spaceships, immortalized in various works of ancient art. 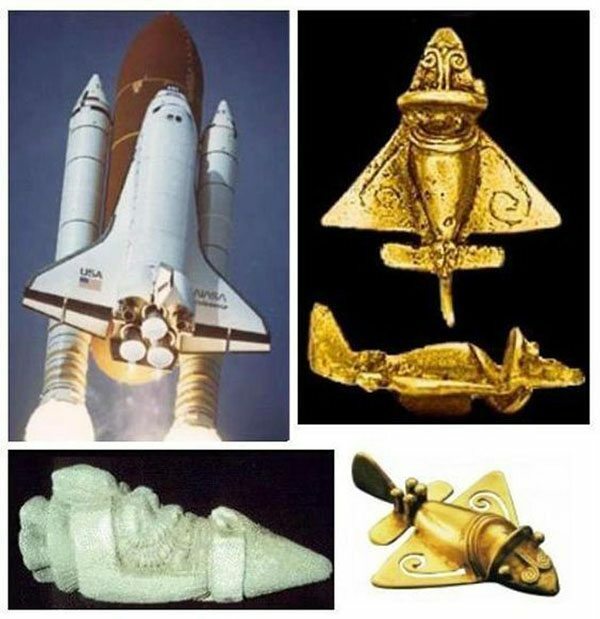 Flight was not just a dream in antiquity, it was a reality, as evidenced by sculptures and engravings of rockets, vimanas, spaceports, landing pads. The Sanskrit epic Mahabharata describes in rich detail great battles that took place in the sky. 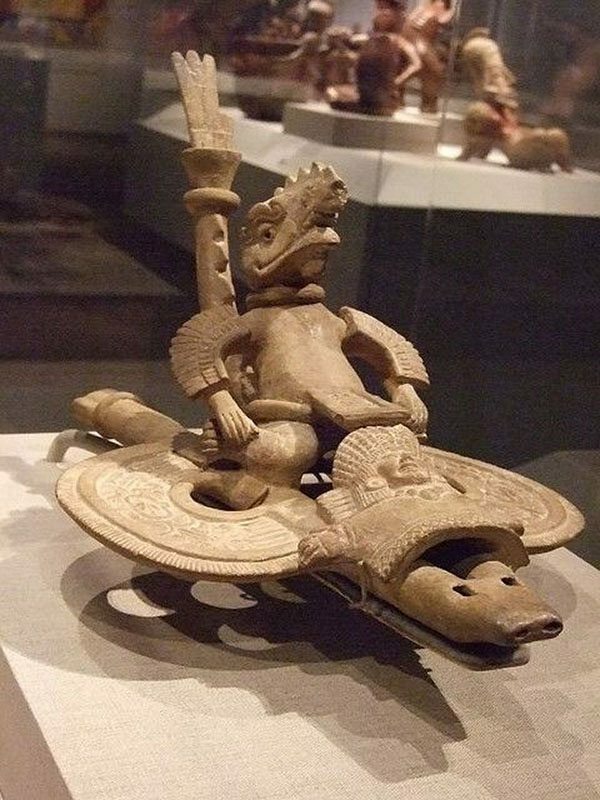 The Mayan ruler Pakal’s tomb features a bas-relief showing the king in a seated position, controlling what looks to us like a flying machine. Is it wise to see these artifacts only in a symbolic light? Do they not offer insight into the reality of ancient flight? What will we gain by ignoring the obvious? In 1992, a geologist exploring a cave in Indonesia’s Devil Hills made a remarkable discovery. On top of a strange pile of rocks, C.A. Castillo saw a mysterious stone that looked like it had been carved by the hand of man. On the surface of the mysterious stone, Castillo noticed a series of patterns that have yet to be explained. The engravings appear to show stars, the Sun, humanoid fingers and arrows pointing in multiple directions. 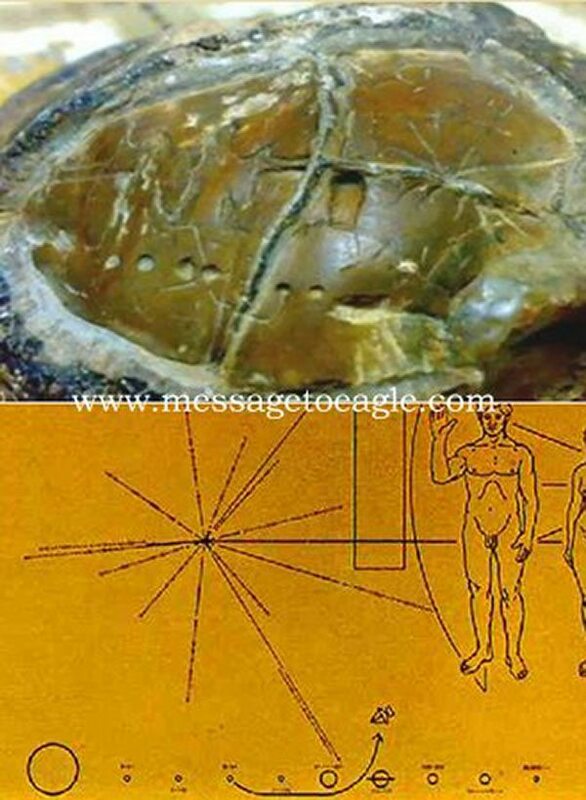 Ufologists were quick to notice the symbols look very similar to one of our modern star maps, the golden disc aboard the Pioneer space probe. Could this ancient rock have served a similar purpose? Is it a map and if so, where does it lead to? If the markings show a star system, it is not ours; this stone shows seven planets and a sun, arranged differently than the solar system we inhabit. Even stranger is the fact that, whenever placed near electrical equipment, the stone starts exhibiting weird magnetic properties. This puzzling artifact raises more questions than it answers. Who were its creators? Did they possess astronomical knowledge and if so, where did they get it from? We may never find the answers to these questions so we are left only with speculation. The Ubaid Lizardmen is the name given to a collection of 7,000 year-old statuettes found in Mesopotamia, the region widely considered as the cradle of civilization. All of these sculptures show an uncanny resemblance to modern depictions of reptilian humanoids. Most of these artifacts were uncovered in an archaeological site called Tell Al’Ubaid, a small settlement in modern-day Iraq. This ancient community predates the nearby Sumerian citadel of Ur by more than 1,000 years. The ancient Ubaid culture remains an enigma to this day. 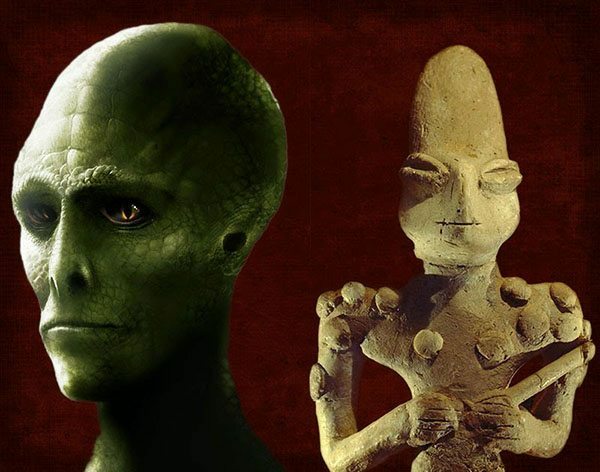 No one knows where they came from, how they looked or where they got the idea to craft representations of reptilian beings. The strange figurines show both males and females in a variety of postures ranging from mothers breastfeeding to dignified characters holding staffs and exuding an air of dominance. This variety of representations has led open-minded archaeologists to conclude that the statues do not show intangible gods, but rather flesh-and-bone creatures that shared the same space with the humanoid Ubaids. Their reptilian characteristics are plain to see and include elongated heads, serpentine eyes, scales and lizard-like snouts. 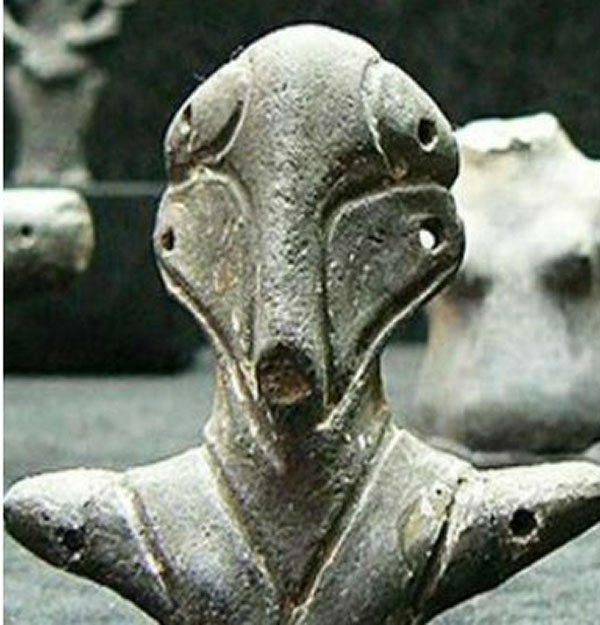 Are these statuettes proof of reptilian hybrid and human cohabitation in the land where civilization arose? Figurines left behind by the Serbian Vinca culture have been puzzling archaeologists for a long time. The scientific world is divided and explanations vary but the mind thinks what the eye sees: these sculptures appear to depict a race of extraterrestrial visitors. The peculiar head shape and the non-human eyes bring to mind the Grey alien archetype, with a bit of insectoid fused into it. 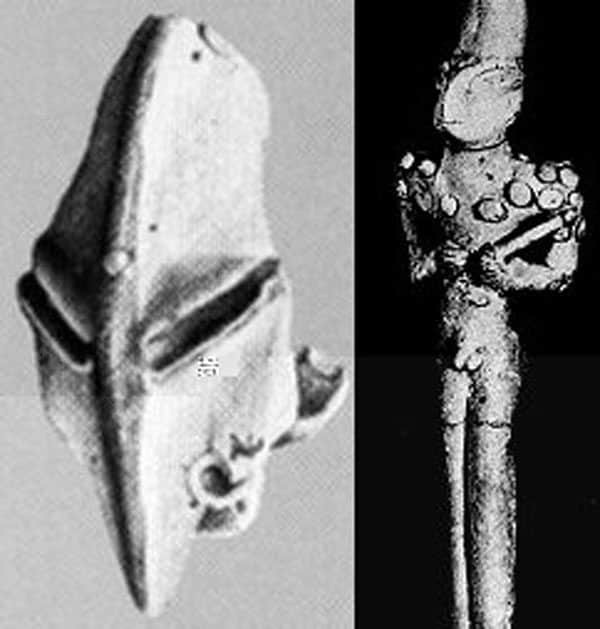 Over 7,000 years old, these statuettes were found in a lot of areas in South-eastern Europe, attesting to the non-locality of these alien visitors. In the 1960s, two brave adventurers, husband and wife managed to become introduced with a mysterious Pygmy tribe in the jungles of Papua New Guinea. As a token of their mutual respect, the two parties exchanged gifts. The tribe elders gave the couple two unexplained artifacts that should not have been in their possession. The intriguing relics speak for themselves: a bust with an elongated head, large otherworldly eyes and a decidedly-alien appearance. The other relic represented a bird or even a flying machine. These ancient artifacts are definitely out-of-place and raise a few legitimate questions. How did the natives know about features not present anywhere in their population? Where did they get the technology to shape, carve and smooth the extremely hard rock? The elders claimed these stone representations had been a part of their tribe for countless generations, their origin lost amid the inscrutable depths of time. Do they show travelers from another dimension? From another time? Or are they simply the product of human imagination? But without reference, how could a tribe hold sacred a pair of stone idols? We’ll never know the answer. The first floor of the Cairo Museum is home to an enigmatic piece whose function archaeologists have yet to discover. 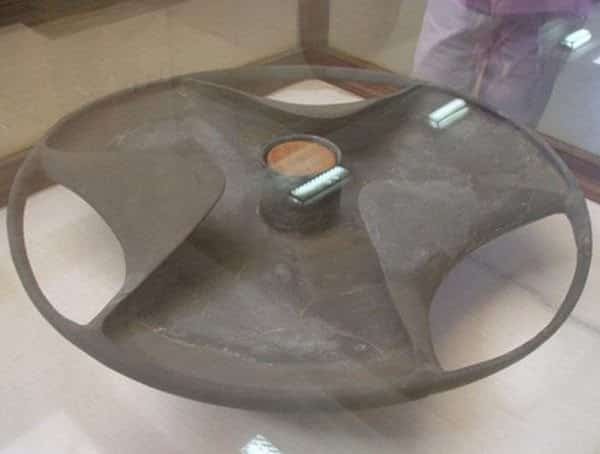 A round plate with three sections bent towards the center, this oopart was uncovered in the tomb of Sabu, the son of Pharaoh Anedjib. Dated at over 5,000 years, this relic could be seen as proof of advanced technology being employed in Ancient Egypt. Its function is unknown and, in an effort to dismiss the conundrum, researchers simply called the object a decorative plate. But it is plain to see that the disc of Sabu is the result of a complex technological process, so its function must have been very specific. Does it not look like a propeller of some kind? Crafted from a very hard stone that was used to make delicate objects, the disc is incredibly thin even by today’s standards. Strong and light is the creed in modern aeronautics, so it makes sense that the same principles also applied 5 millennia ago. Coupled with the idea that ancient Egyptians produced and used electricity, this piece of machinery could suggest we were not the first civilization to reach a somewhat advanced technological level. Ignored by mainstream science, these incongruous relics hold in them the potential to awaken humanity to an alternative scenario, one where life is cyclic and most of the times, there is nothing new under the sun. And who knows how many other artifacts are hidden away or await discovery.